Duct Tape: The Video brings The Duct Tape Books to life. A special repackaging of Jim and Tims television shorts, "Mega Mini Movies" with some special footage from our round the world tour, this video clocks in at over 30 minutes. The wacky and creative G-Rated material is appropriate for family viewing. FREE DUCT TAPE! Each video contains a coupon for FREE Duck® brand Duct Tape! This is a great gift for Birthdays, Mother's Day, Father's Day, Christmas... heck  who needs an occasion? Just pick it up now for only $10.00 (includes a FREE humor book and Duct Tape Pro Bumper Sticker). 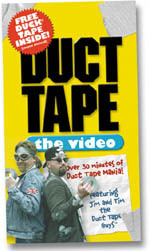 Click here to order now to get to the Duct Tape Pro Shop. Or, better yet, get our video and a Duct Tape Pro cap (one size fits all) delivered for only $15.00! 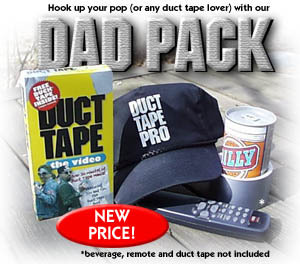 Just click here to order The Dad Pack at the Duct Tape Pro Shop. Click the movie stub above to see a clip from our new video. 100% of the people who have reviewed our video LOVE IT!